In the Slides panel, select a slide on which you want to insert graphics. Click Insert > Image, or click Insert Image on the toolbar. On the Image from File page, click Browse and specify an image file to upload. 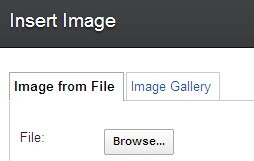 On the Image Gallery page, select an image.